If there has been a singular visual art event in the last 5 years that has not only grown exponentially but also serves to catapult local artists into international attention it is the Grenada Contemporary exhibit hosted by Susan Mains Gallery. The evening of Friday, October 27th, at Spiceland Mall, people were met with the beating of drums, never before seen art, and that feeling – the feeling of creative critical mass. There was palpable convergence of artists, communities, and countries in this #grenadaartisland, an environment that can be described as an incubator of creative expression. Working with the curatorial theme, “Westindian”, artists imagined and expressed a wide range of experiences relating to the idea of a regional “oneness”. 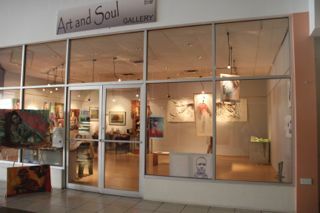 The event spilled out into the halls of the gallery and with the drummers from Upper St. John present, the whole of Spiceland Mall for the evening, was fixated on the pulse that Susan Mains Gallery was generating. The drumming of Godrey Luke and the children of Ashanti Footprints may have been many’s first encounter with the exhibit and there couldn’t have been anything more appropriate. The sound of the drums were pre-Westindian, the history of the West Indies and the West Indies right now. Godfrey Luke is also a sculptor; his figures made of found objects greet visitors to the gallery and they too span time and space. The combination of materials Godfrey uses span a Grenada (and West Indies) that was, that is, and what may be. 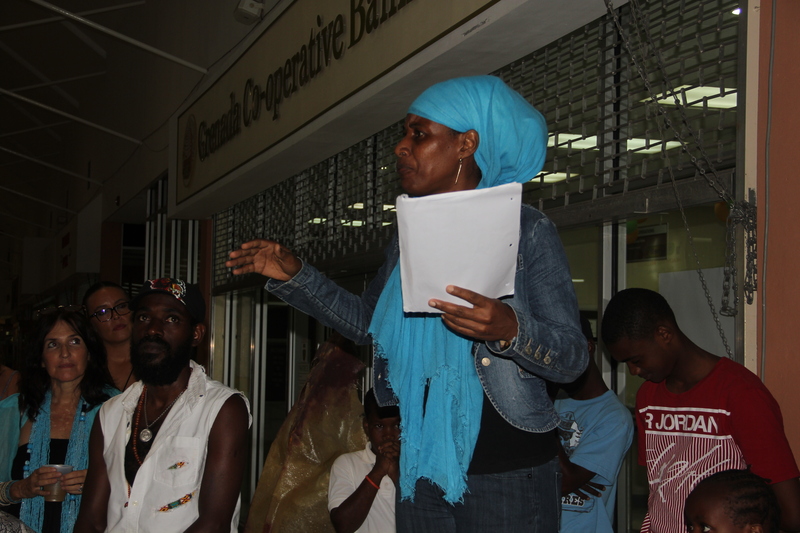 Also from Upper St. John, Judy Antoine read a few pieces of the poetry she wrote and despite there being a lot of people, despite it was in a big hallway at Spiceland Mall, Judy Antoine was mighty. Brene Brown says about vulnerability, “Vulnerability sounds like truth and feels like courage. Truth and courage aren’t always comfortable, but they’re never weakness.” Judy Antoine, voiced things in her poems that people only whisper and Judy Antoine was the strongest person in sight. Also before you even get into the gallery itself you see Rene Froehlich’s work, his fibreglass figures evolving at every exhibit and Ingrid Newman’s work. Newman, from South Africa has settled in Grenada and made a beautiful chandelier piece that uses plastic refuse and naturally occurring material. Her treatment of the plastic was like lace in some places and was easily one of the most exquisitely executed pieces made from plastic and “trash” that we’ve seen. Oliver Benoit’s “confessional” piece in the middle of the gallery also attracted a lot of attention. The confessional itself is a commanding presence, a proverbial “elephant in the room” and mature audiences are invited inside to hear harrowing stories fed in through the confessional screen. These stories are all too common and one of the less than positive commonalities in the West Indies… putting us in the position where we are hearing them provokes the question, can we forgive? Who can be absolved? With 30 artists represented, the show continues to offer more perspectives on the theme of “WestIndian”. In my opinion, being Westindian is an exploration into what it means to be fully human. Not only in reaction to a colonial history but also as a region that does not invest in standing armies and in many ways is very socially advanced. If part of being WestIndian is being fully human, it opens our audience to look at the human experience of the artists from India, Iran and every hyphen identity that exists in the show. Grenadian-American, British-Grenadian, American-living-in-Grenada, can be subsumed and interpreted not under nationalistic standards but in response to a call for imagining a better way of being human. This brings Susan Valentine’s work into close proximity with John Henry’s and Roxanne Marquez-Augustine’s work in relation to Lavanda Mireles’. This “ness” of being Westindian creates a captivating rhythm between Rekha Sameer, Asher Mains and Jessica Holland’s work – strangely familiar, anatomical and natural. 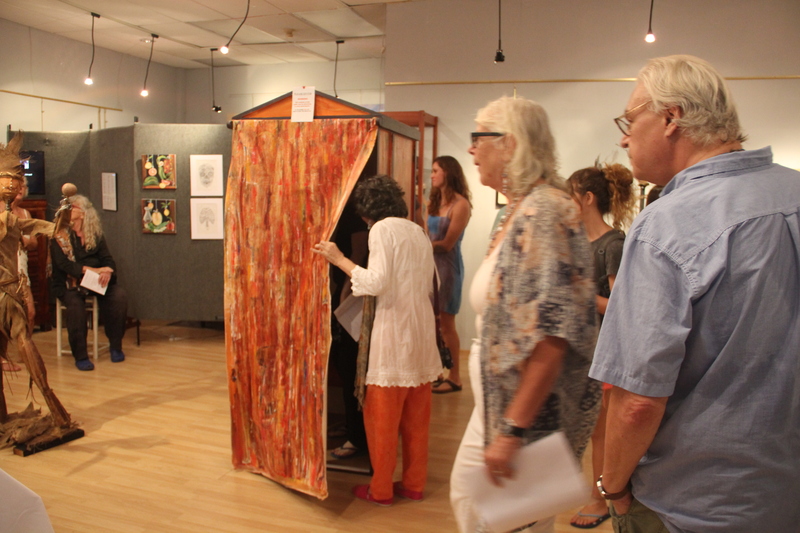 Ultimately it’s up to you, the audience to come and see all the pieces and experience the 4th Annual Grenada Contemporary for yourself and draw your own conclusions! 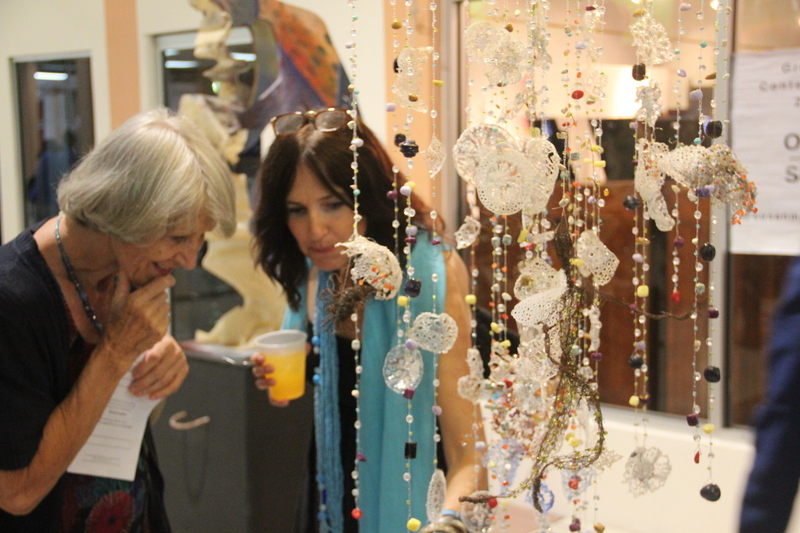 Susan Mains Gallery is open 10:00am to 5:00pm Monday through Saturday and the show will be up until November 11th! Please comment if you’ve seen it or write in our guest book at the gallery!